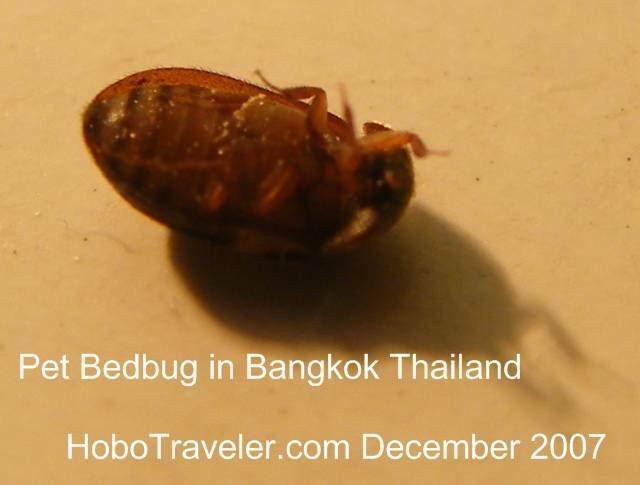 I sprayed a bedbug yesterday with insecticide. I then put in a plastic bag, and the crazy thing is still alive today. I guess what you cannot kill, you can always make into a pet. I really do not want to learn about bedbugs. Well, I have learned, they move pretty slow, and if you want to coral them, take a lit light bulb and they will avoid it. Therefore without touching it, you can get it to change directions. The seem slow to right themselves is you turn them over, in many ways they act like a turtle. I am trying to think of a name. Maybe I can take one them long Thailand girls hairs and make a leash and take it for a walk. If it is necessary to live with bedbugs in the short term, it is possible to create makeshift temporary barriers around a bed. Although bedbugs cannot fly or jump, they have been observed climbing a higher surface in order to then fall to a lower one, such as climbing a wall in order to fall onto a bed. That having been said, barrier strategies nevertheless often have beneficial effects: an elevated bed, for example, can be protected by applying double-sided sticky tape (carpet tape) around each leg, or by keeping each leg on a plastic furniture block in a tray of water. Bed frames can be effectively rid of adult bedbugs and eggs by use of steam or, used with caution, by spraying rubbing alcohol on any visible bugs (although this is not a permanent treatment). Small steam cleaners are available and are very effective for this local treatment. A suspect mattress can be protected by wrapping it in a painter's disposable plastic drop cloth, neatly sealing shut all the seams with packing tape, and putting it on a protected bed after a final visual inspection. Bedding can be sanitized by a 120 °F (49 °C) laundry dryer. Once sanitized, bedding should not be allowed to drape to the floor. An effective way to quarantine a protected bed is to store sanitized sleeping clothes in the bed during the day, and bathing before entering the bed. Another new treatment that is extremely effective on bed bugs and on even insecticide resistant bed bugs is the new Cryonite treatment. This treatment actually freezes the liquid in the cells of bed bugs and has an effective kill rate even on the hard to kill eggs. Cryonite has been widely used in Europe and Australia and some pest control companies are just now starting to offer this highly effective service that is non-toxic, environmentally friendly, and will not saturate your bedding with chemicals.